After a long, very hot, dusty, and wildfire-smokey Labor Day at the Scatter Creek Wildlife Management Area in Rochester, Washington, I was tired. Carlin and I had just run his 10th passing master-level spaniel hunt test. He’d gotten to go swimming as part of the test, so he was refreshed, but I wasn’t. I knew Carlin had passed the test. 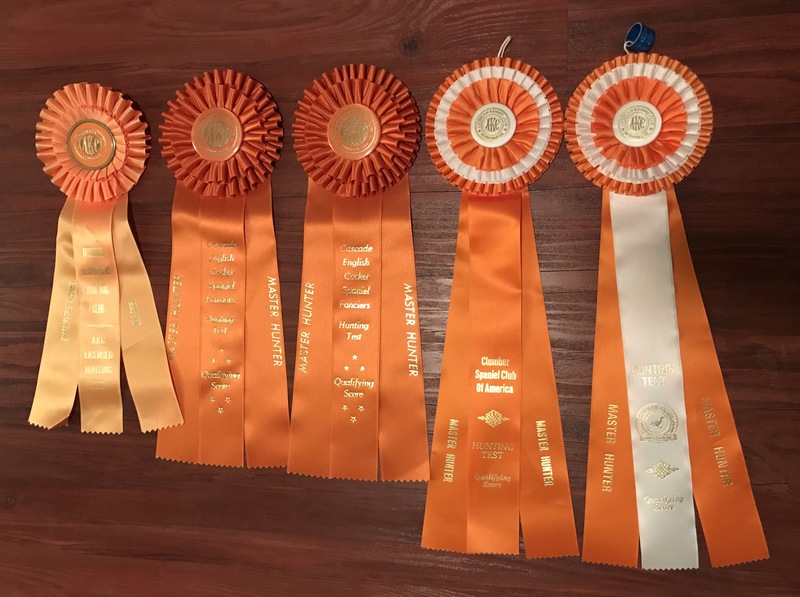 But I wasn’t sure that his scores were good enough to get that last high-scoring pass needed to qualify him for the Master Hunter Upland Advanced title. To earn these Advanced titles, the dog must first have earned the initial title with however many passes that takes. So, for a Master Hunter title, the dog needs to earn 5 Master Hunter passes. Then, the dog needs to earn that number again, but this time each a with score averaging 8 or more. So, that was it. Carlin had earned the highest possible title in spaniel hunting tests. More than two years of testing and three of training, working toward this goal. And we finally made it. I cried and hugged Russ, the judges, my trainer, Carlin, the test secretary, and just about anyone else who looked like they wouldn’t mind being hugged.